It’s still lurking at a decent price (US$520 with optical finder, US$485 without), but a few managed to get a full Coolpix A set for about US$400 during the Christmas rush/closeout. And those that did got what I’d call a real bargain in the photography world. No, it doesn’t focus fast like a Fujifilm X100T (US$700 more expensive at the time). No, it isn’t a perfect camera, having a bit of plastic fantastic compactic to it (e.g. battery compartment door, which failed on my unit). No, it isn’t 24mp. No, it doesn’t do 4K video. No, it doesn’t have a super duper fast 24-70mm equivalent zoom. Heck, it doesn’t even have an EVF (which is why you wanted to pick it up with the optical finder if you could). What the Coolpix A has is just a great 16mp Sony DX sensor with no AA behind a equally great Nikkor 28mm (equivalent) f/2.8 lens. All in a package that almost makes it into a shirt pocket, but certainly makes it into a jacket pocket. Simply put, I don’t know of anything else brand new that you can get better images from for US$400. Looking for a good candidate to modify to infrared? Coolpix A. Looking for a small camera to dedicate to shooting B&W? Coolpix A. Looking for a small camera to rig for pano stitching without needing the typical giant, complex head? Coolpix A. Looking for something inconspicuous that can net you great street photos in low light? Coolpix A. Looking for a jacket pocket camera that fits your current Nikon DSLR workflow? Coolpix A. As I noted in my review of the Coolpix A, the A is essentially a Nikon D7000 made ridiculously small and mounted with a wide angle DX lens Nikon never made for the DSLRs. Oh, and did I mention that the lens focuses close? Not Micro-Nikkor close, but close enough to be considered quasi-macro. Of course, the problems of the Coolpix A were simple: initially overpriced and slightly too compact camera-ish in its handling. It’s funny how taking care of one of the problems (overpriced) suddenly makes the other problem not so problematic. It’s also funny how many people just ignored this bargain when it went into a ballistic price drop as Nikon cleared inventories. Nikon got a lot right with the Coolpix A, but they got enough wrong that it simply turned most potential users off. This was a camera that needed just a bit more attention to how it handled, needed the optical finder to come with it standard, and needed to be at a more reasonable price for what it was. Remember, it was essentially a D7000. But without the mirror, the AF system, the extra metering sensor, the prism, a separate compartment for the card slot, and a host of other things, yet it sold at D7000 list price. Sure, it had a lens that the D7000 body didn’t come with. A very good lens. But still, most enthusiasts were going to look at the price and decide that a DSLR did more. This is one of the problems we’re seeing more and more in the camera business as things collapse down to just a series of serious models: prices are all squeezed together. In the US$500-1000 range you can get a large-sensor compact, a mirrorless camera, or a DSLR. Heck, in many cases the DSLR is the least expensive of the three, yet it’s the most complex. Personally, I think of the Coolpix A as a terrific 28mm DX lens. A lens that comes with a camera built in. Had Nikon offered us an 18.5mm f/2.8 DX lens for US$400, every DX user would have scooped one up. Yet when they offered us this holiday season an 18.5mm f/2.8 DX lens with a built-in camera for US$400, not many DX users picked one up. Go figure. Yep, consumers aren’t terribly smart sometimes. I’m hoping that Nikon learned a few lessons from the Coolpix A, but fear they didn’t. To sell at the price they wanted it to, it really needed to be complete (optical finder, filter holder, lens hood). It also needed to not be half pro build and half compact camera build. 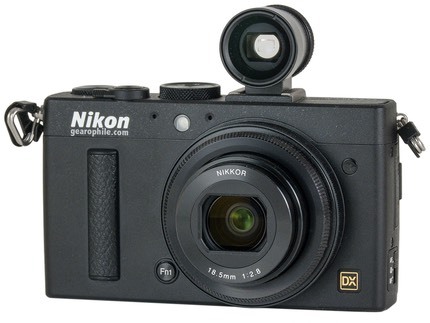 Like a number of other Nikon models recently, the Coolpix A felt like a “parts bin” camera, where Nikon just threw together bits and pieces they already had, and didn’t really engineer enough from scratch and weed out the incongruities of the parts. Finally, it needed to be clearly and totally a minimum of prosumer at that price point. That means 14-bit Lossless Compressed as an option, amongst other things. As I noted in my review, a few other things would make the A into the camera it should be, specifically a good phase detect focus system with excellent performance and some attention to the control system. But obviously we didn’t get a phase detect focus system because then the Coolpix A would have needed its own sensor, not borrow the D7000’s. That’s the problem with parts bin cameras: you can only do what the parts let you. Still, the Coolpix A is lingering around at bargain prices. You should really consider whether having an excellent small DX compact in your gear closet is something you’d enjoy. Every now and again, I take mine out, and my reaction is the same every time: superb optics/sensor give me excellent images, but the focus performance isn’t up to fast moving subjects and the UI/build seem inconsistent. But oh those images. The Coolpix A takes better images at 18.5mm than a D7000 with the kit lens, by far. It approaches the D7100 with the kit lens. In the end, isn’t it all about the image?